A new treatment protocol – Comprehensive Opioid Response with the Twelve Steps (COR-12™), embraces the latest and best research, which indicates that certain medications can be used to improve treatment engagement and future recovery outcomes for people with opioid use disorders. The use of medications has been integrated with the evidence-based, world-class Twelve Step facilitation model to form the foundation of a unique approach that provides long-term, wraparound services individualized to the needs of patients with opioid use disorders. 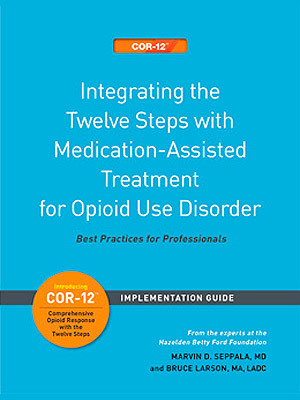 “Integrating the Twelve Steps with Medication-Assisted Treatment for Opioid Use Disorder: Best Practices for Professionals” guides administrators, clinicians, doctors, and nurses in implementing this groundbreaking program at residential and outpatient facilities. Following the Hazelden Betty Ford Foundation experience from admission through treatment and recovery services, it shares best practices for helping patients achieve a stable recovery lifestyle with the ultimate goal of abstinence. Included in this program is a CD-ROM with reproducible patient and family resources, as well as clinical and medical guidelines that support evidence-based research on medication-assisted treatment, Twelve Step facilitation, motivational enhancement therapy, cognitive-behavioral therapy, and the stages of change. The accompanying DVD follows the Hazelden Betty Ford Foundation patient experience from admission to recovery services, with interviews and highlights of the COR-12 program for medical staff.